Inflammatory cysts are by far the most common cystic lesions in the jaws; they constitute 50 to 75% of all oral cysts, ,,, Developmental odontogenic cysts and inflammatory odontogenic cysts are characterized by slow growth and expansile tendency and despite being entities that present a benign biological behavior, they can reach considerable size if they are not diagnosed in time and treated appropriately. A 45-year-old mentally challenged male underwent a routine clinical examination. This examination revealed poor oral hygiene, hence several sessions of scaling and root planning were performed. A large cavity that looked like a perforation was clearly seen from the buccal side of the crest at the level of the upper right 1 st molar tooth [Figure 1]. Surprisingly, the patient was not aware neither disturbed by this problem even though a putrefying mass of food was always filling this defect. The patient's past medical history was non contributory. After discussing with his relatives, we learned that his first upper right molar tooth was extracted ten years ago. 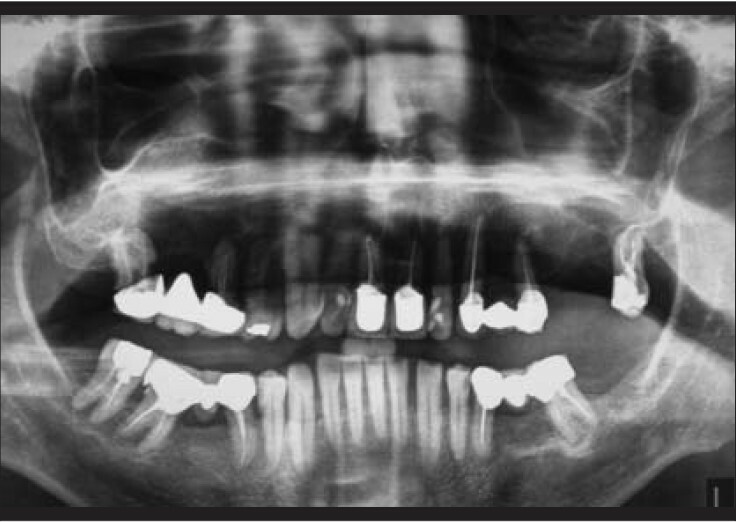 A panoramic radiograph [Figure 2] was made; it revealed a radiolucent area in the right maxillary region corresponding to the previously extracted right first molar tooth. To establish a differential diagnosis. Panoramic reconstruction [Figure 3] showed a large (2 × 4 × 3 cm), unilocular, low-density area in the right maxilla, extending horizontally from the root of the second premolar to the distal root of the second molar. The lesion was elevating the floor of the maxillary sinus with no clear interruption, the anterior aspect presented with an ill-defined margin and a remarkably sclerotic bone. A possible interruption of the floor of the maxillary sinus was noted on the posterior aspect of the lesion suggesting a direct contact between the lesion outline and the Schneiderian membrane of the maxillary sinus Cross-sectional images [Figure 4] showed elevation of the floor of the maxillary sinus without interruption. 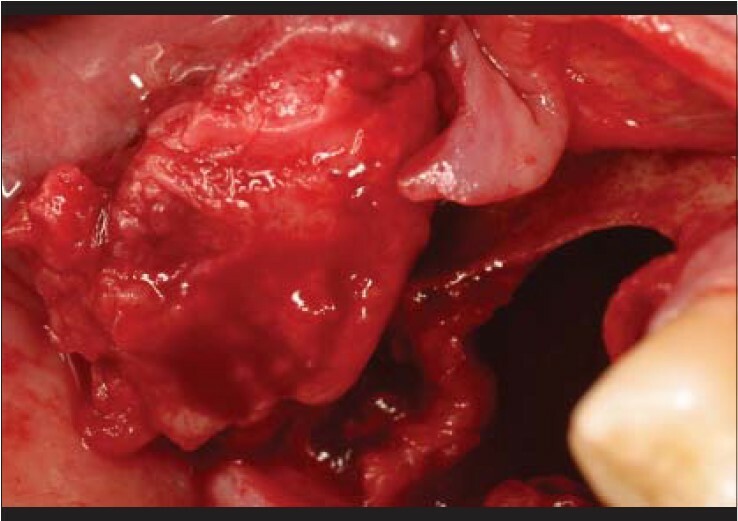 These images showed also an empty cavity surrounded by a thick soft tissue lining and sclerotic bone margin. The alveolar crest was interrupted with moderate buccal and palatal cortical expansions. In the beginning of the surgery, the second premolar and the second molar were removed but since the risk of a sinus perforation existed, a separation of the roots of the second molar [Figure 5] was done to minimize the risk of fracture of the buccal plate. During the intervention, all the measures were taken to avoid a, highly possible, oro-antral communication. 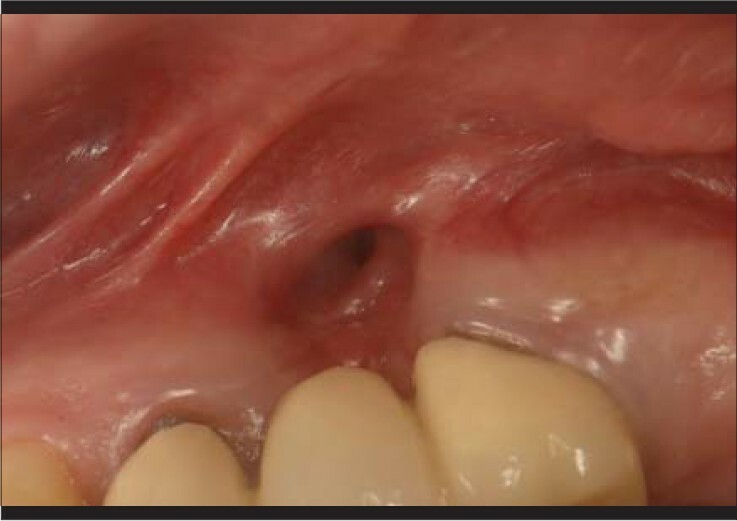 The incision on the crest was slightly palatal with two mesial and distal release incisions in order to have a good exposure of the lesion and to ensure presence of bone support under the sutures. A full thickness flap was raised, then the removal of the lesion was performed in two steps; the first using a curette, always with bone contact approach, the second, for the most posterior and internal part [Figure 6], where a dissection was done to separate the Schneiderian membrane from the lesion. This double approach was suggested by the CBCT images where the bone on the distal aspect appeared to be interrupted. On inspection of the defect, no opening with the sinus cavity was found and the Valsalva maneuver was negative. 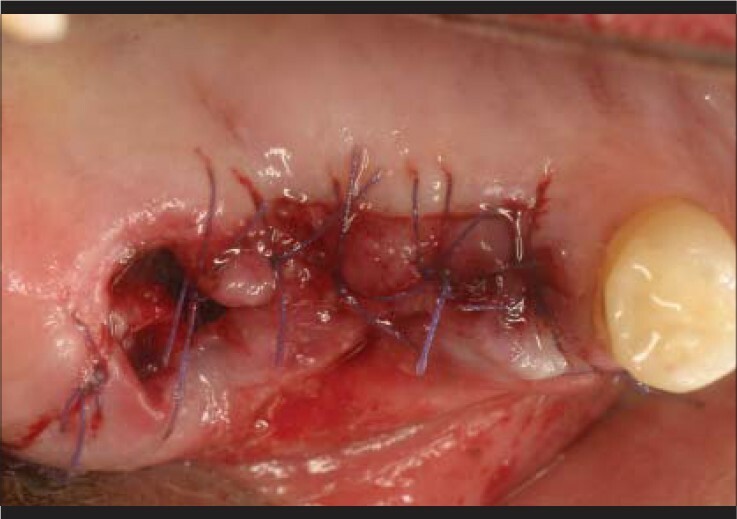 The cavity was carefully rinsed by saline solution and the flap was sutured at the initial incisions using resorbable 4/0 sutures [Figure 7]. For the first two weeks, follow up was done every other day to inspect the wound and clean the cavity of remaining food. For the two following months, the patient was seen once a week to monitor the healing of the wound; the depression was getting shallower until reaching the same level of the crest. Microscopic examination showed a cystic structure lined by a stratified squamous non-keratinizing coating of variable thickness. No atypical features were present. 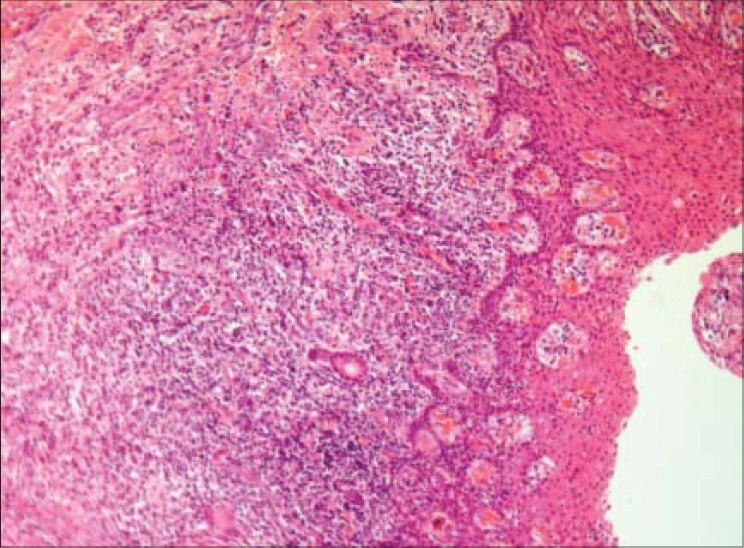 The cyst wall is fibrous and dense by polymorphic leucocytic exudates [Figure 8]. An intra-oral and a panoramic radiograph taken at 6 months after the surgery showed a full radio-opacity indicating a good healing and bone repair [Figure 9]a, b. The anatomy of the maxillary sinus, especially in the area of the second premolar-first molar, increases the possibility of post-extraction oro-antral communication. This communication can be caused also by a dental infection and a subsequent radicular cyst formation, which will cause an interruption of the maxillary sinus mucosa and fast propagation of the infection within the sinus. Oro-antral communications might have serious repercussions on all paranasal sinuses and will require a surgical treatment with intervention of an otorhinolaryngologist. 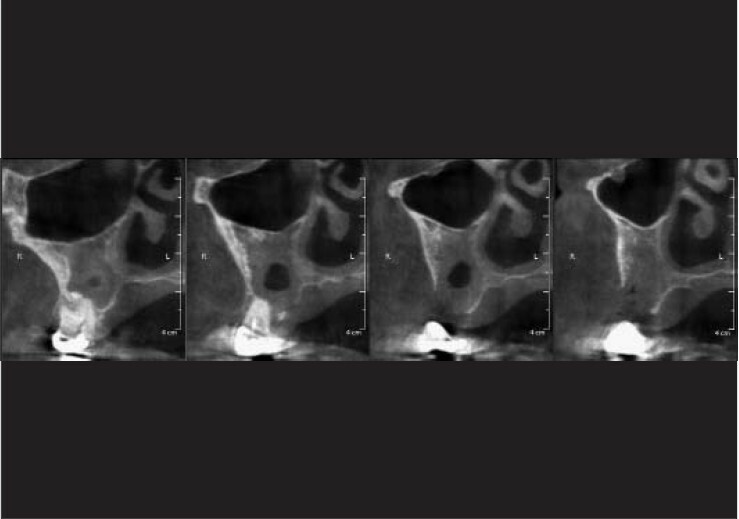 The use of CBCT in this case was crucial; the thin, superimposition-free, panoramic reconstruction and cross-section images gave a completely different perspective on the anatomy of the lesion and shifted the diagnosis from an oro-antral communication to an extra-sinus cyst that was not even interrupting the floor of the maxillary sinus; it was just displacing it superiorly. 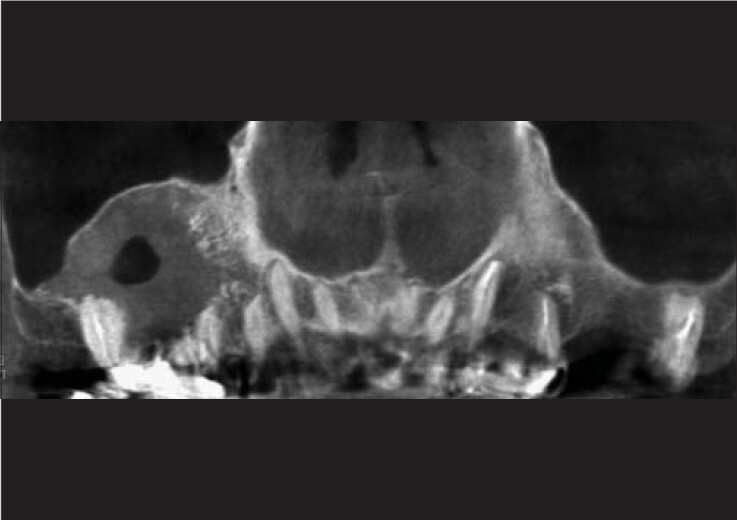 The meticulous radiographic interpretation of the high-resolution images suggested a severe thinning of the floor of the maxillary sinus in the posterior segment; this finding was confirmed during the surgery where the surgeon had to dissect the cyst epithelium from the maxillary sinus membrane. 1. Kavita R, Smitha-Umadevi HS, Priya NS. Clinicopathological study of 100 odontogenic cysts reported at V S Dental College- A retrospective study. J Adv Oral Res 2011;2:51-8. 2. Prockt AP, Schebela CR, Maito FD, Sant'Ana-Filho M, Rados PV. Odontogenic Cysts: Analysis of 680 cases in Brazil. Head Neck Pathol 2008;2:150-6. 3. Meningaud JP, Oprean N, Pitak-Arnnop P, Bertrand JC. Odontogenic cysts: A clinical study of 695 cases. J Oral Sci 2006;48:59-62. 4. Murmura G, Traini T, Di Iorio D, Varvara G, Orsini G, Caputi S. Residual and inflammatory radicular cysts. Clinical and pathological aspects of 2 cases. Minerva Stomatol 2004;53:693-701. 5. 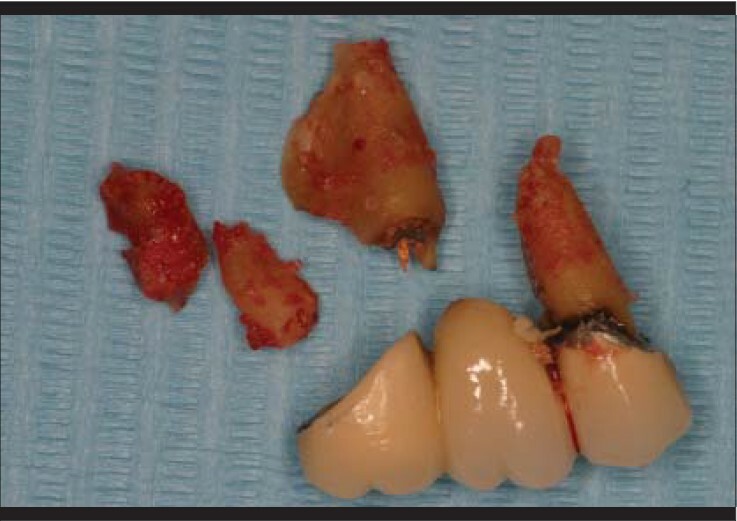 Ochsenius G, Escobar E, Godoy L, Penafiel C. Odontogenic cysts: Analysis of 2,944 cases in Chile. Med Oral Patol Oral Cir Bucal 2007;12:85-91. 8. Oehlers FA. Periapical lesions and residual dental cysts. Br J Oral Surg 1970;8:103-13.